Raising A Chow pup and having a child a couple years after. My name is Maurice, and i have a question about owning and raising a Chow to all you Chow owners out there. Me and my girlfriend are moving in together next Januari, in a cosy house with a nice average sized garden. We have been talking and researching about adopting a Chow pup for quite a while now, but there is just one question i feel like it has not been answered by our research. And this is why i am asking the question to y'all, the experts! My girlfriend and i believe that the way te Chow is raised impacts a lot on the way the chow would handle the arrival of a newborn child. Unfortunately my girlfriend and i are a little bit on the fence now because of all the negative things you read online about the Chows being not compatible with children by nature. 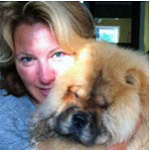 Our question is what your experiences are, while growing up with Chows, or having a Child while having a Chow. We are both completely in love with the Chow because of it's described character, which is very much exactly what we look for in a dog. We hope y'all can help us with our desicion and take our doubts away! Thanks in advance for your answers, and i wish all you guys a very nice day! Re: Raising A Chow pup and having a child a couple years after. Personally grew up with chows, never had an issue with friends or myself. Currently have two chows, they adopted several kids in the neighbourhood, they can pretty much do anything around them. Our youngest at 6 is not fond of kids in snow suits. But she hasn’t offered to eat any. Just goes around. Our big guy has pretty much scene and done everything and even puts up with the ones he may not like. He was very excitable when young but still didn’t eat any. If they rush him he might challenge them, but thats to be expected. Anyway, I never blame animals, just people.